Every work day starts the same way for Scott Haas. He arrives at 6:45 AM and before anything else, he makes his rounds to his staff at Martin Dining Hall and Scoreboard Market. While Haas’ morning routine may seem like a small part of his day, it goes a long way. Haas wants his staff to feel comfortable coming to him for assistance and that starts by building a solid working relationship with each employee. Haas grew up in the small town of Bath, Indiana. Born and raised on a farm, Haas always thought he would be a farmer. As a teenager, Haas took a job at a fast food place where he would use his free time there to mix different dishes, prompting his initial interest in food service. He attended culinary school, becoming a certified chef, and then took an assistant manager job at a family-owned cafeteria in Richmond, Indiana where he worked for 10 years, prior to his time at Miami. 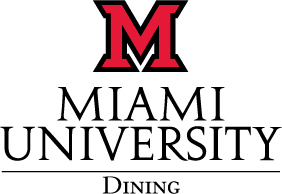 Haas started at Miami in 1990 as an assistant manager at Erickson Dining Hall where he worked for two years. Over the last 26 years, Haas has worked in concessions, vending and served as the manager of the warehouse and dock operations, among other titles. It wasn’t until last summer that Haas took his current role at Martin. Now, Haas oversees Martin Dining Hall and Scoreboard Market where he handles food ordering, makes schedules, ensures staff are where they need to be and keeps the operation running smoothly. Much in the same way he values communication with his staff, Haas checks in with guests multiple times throughout the day to ensure everything is going well, further fostering open communication. Haas is easy-going but works hard to provide the very best service for his guests. He makes an effort to build working relationships with his staff and with students to ensure that Martin Dining Hall and Scoreboard Market operate smoothly. Haas loves getting to know people through these means, but he is still happiest when guests are happy with their meals. Favorite dish to prepare? To eat? Prepare – I haven’t done it for a while, but I like making lasagna at home. Eat – A good steak. What’s something that’s on your bucket list? I want to visit every state eventually. I’ve been to quite a few and some of them you go to over and over, but eventually, I want to be able to visit every state, whether we drive or fly, and visit some different countries. You have to be able to adapt to changes. In the last five years, our department has changed. My family has changed. I have had two kids get married, and in the last six months, they’ve each had a child. One grandchild will be six months next week and one was a week old yesterday, so I think you’ve got to adapt to change, whether it’s at work or whether it’s with family life. There are always things that are going to change and if you can’t adapt and make changes, you’re not going to make it. I would say a steak of some kind. A baked sweet potato. Creamed spinach with bacon. Tossed salad. A roll and then some kind of fruit pie. I’m the happiest when I’m just relaxing. Overall, I’m happiest with how well my kids have done. I was the first child in my family to go to college and now all my kids have gone to college. They’re all doing very well. What kitchen appliance are you and why? I’d say a gas grill because I’ve done so much on a gas grill whether it be baking, or frying, or grilling, or roasting. I’ve fixed just about anything. A pineapple upside down cake on the grill, I’ve baked cookies, I’ve made pancakes, I’ve just done everything you can do. What’s one thing people may not know about you? I actually played a pickup basketball game with Larry Bird. I went to school in the town he was born and raised in, French Lick, Indiana. It was the spring before he got famous in the NCAA tournament and me and some of my friends from college went to one of the town parks to play some basketball. There were three people at one basket, and then five of us at our end, and they came over and said, “Hey, do you guys want to play a game?” We said, “Sure.” We asked how they wanted to divide it up, and they said, “Why don’t you five play us three.” We knew this guy was big. We started playing and, of course, it was more or less like one against five. He was amazing. Then, the following March, we’re sitting in our rooms watching the NCAA tournament and we thought he looked familiar. Apparently he was on spring break at the time we were playing. It was weird knowing you played against somebody like that. Cat or dog? Definitely dog, if I had one.